Conservative estimates reveal that between 10 and 25% of the world population suffer from hypoglycaemia, or low blood sugar. The blood sugar level fluctuates naturally during a period of twenty-four hours. Normal range is 70 to 120 mg/dl after an overnight (12 hours) fast. In healthy women, glucose levels can be as low as 35 mg/dl after only 24 hours of fasting In most healthy people it does not occur unless glucose levels drop below 45mg/dl, though in elderly people hypoglycaemia can occur at higher levels. Hypoglycaemia can be difficult to diagnose, though usually if symptoms are present and can be resolved with intake of glucose, then hypoglycaemia is certainly indicated. The pancreas is the organ that regulates our body's level blood sugar (glucose). When carbohydrate foods (starches and sugars) are eaten, the pancreas secretes insulin, which carries sugar from the blood to the cells, to provide energy for the body. In the normal situation, every time we eat carbohydrates, there is a rise in blood glucose, which stimulates the pancreas to release its insulin. Insulin is a hormone produced to regulate the blood glucose level. In contrast to adrenaline, insulin decreases the blood glucose level. As the blood glucose level rises after a meal, the pancreas to lower the glucose level releases insulin. As the blood glucose falls, the insulin released from the pancreas decreases. Therefore, insulin is part of the regulatory system of the body that maintains the blood glucose in the normal range. Low glucose levels, usually manifests as reactive hypoglycaemia, which occurs 2-5 hours after a meal. Normal insulin response begins ½- 1 hour after eating, whereas in this instance, insulin peak occurs at about 2-3½ hours after a meal. By this time levels of blood sugar and insulin do not coincide because the blood has already been taking up glucose for some time. Insulin's late arrival results in a dramatic drop in glucose levels. Hypoglycaemia causes the body to release adrenaline. The adrenaline functions to restore and maintain blood glucose levels by mobilizing stored glycogen and fat, converting them into glucose. In turn, the released adrenaline causes symptoms of nervous system. This results in symptoms such as sweating, shaking, increased heart rate (palpitations), anxiety, weakness, thirst, hunger and blurred vision. This can be caused by missing a meal or not enough simple carbohydrate in the meal, drinking alcohol without food or too rapid absorption of insulin. For sufferers of diabetes, administering too much insulin and/or skipping meals can also cause incidents of hypoglycaemia. 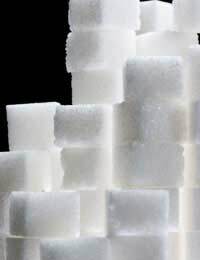 If you are suffering from hypoglycaemia you should avoid refined sugars. The best type of diet for you is one that is low in carbohydrates and high in protein. You should seek the advice of a dietician if you feel you are showing signs of hypoglycaemia and are thinking of modifying your diet. Tolerance and balance of carbohydrate/protein volume of meals varies among different people so you should keep a record of your meals and any hypoglycaemic symptoms you experience in order to be able to work out with your dietician, what kind of balance is most suitable for your. If you are exercising regularly, do not perform excessively without a snack. It is good to keep a small piece of cheese or dairy snack handy while training so you can boost your protein.